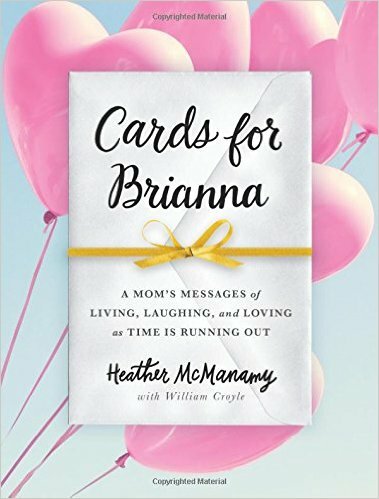 That gives you the idea of the humor you'll find in a book I recently got to read, Cards for Brianna: A Mom's Messages of Living, Laughing, and Loving as Time Is Running Out. I'll be honest, as a mom it was hard to read this book, imagining what I would be facing if I knew I was going to leave my beautiful daughters. But at the same time, the book was funny and inspiring, and Heather has the same strong spirit that I would hope I would have if I faced a terminal illness. 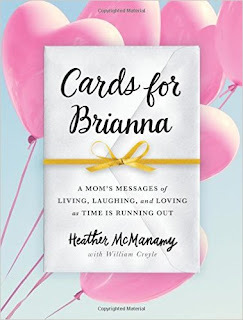 The book shares some of the cards that she has written to be shared with Brianna as she reaches certain milestones - birthday, wedding, tough times, celebrations. The book was finished just hours before she died. A portion of the book's sales has benefited METAvivor - a non-profit, volunteer-run organization that funds research for metastatic cancer (which often receives a lot less awareness than other types of cancer). It's a sad, yet inspiring story that I'm glad I got to read.